1st floor (entresol): was reserved for merchants and shops. 2nd floor (étage noble): was for the wealthiest families. 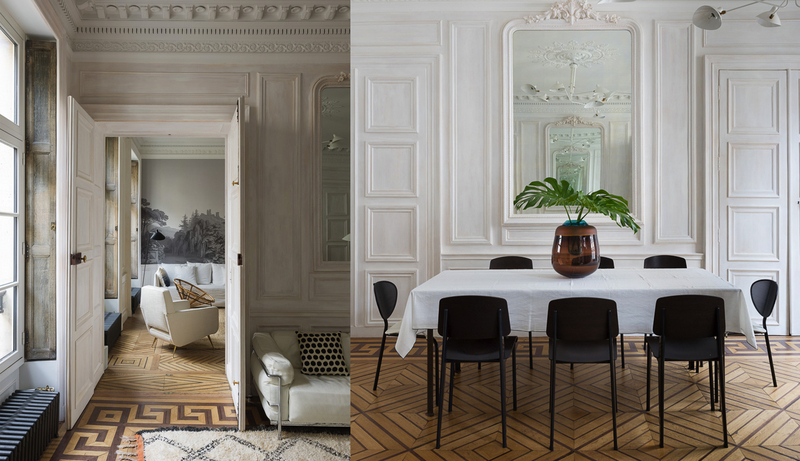 3rd, 4th, & 5th floor: also for well-off Parisians, but had less grand interior details and slightly lower ceiling heights. 6th floor (chambre de bonne): was reserved for the servants and featured a slanted roof. 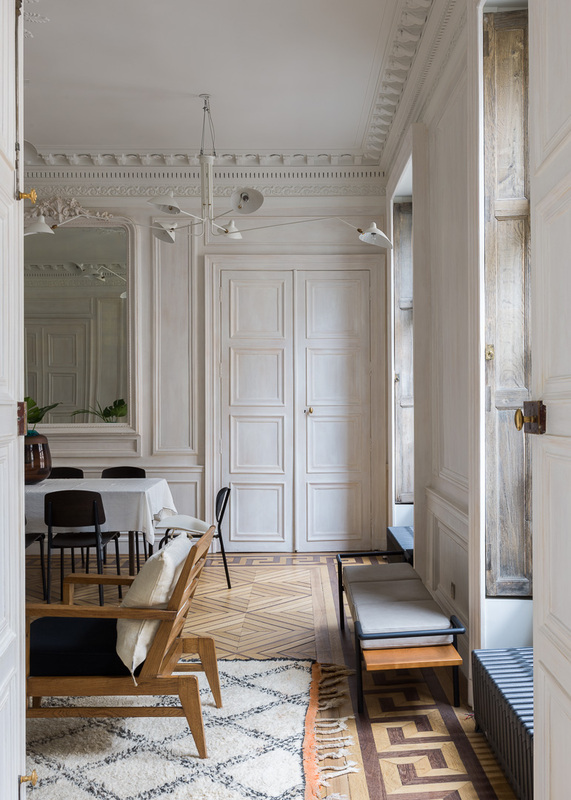 The magic of Paris and its interiors isn’t something that was left to the good taste of its inhabitants, par hasard, it was very much a planned and intentional project for the city. 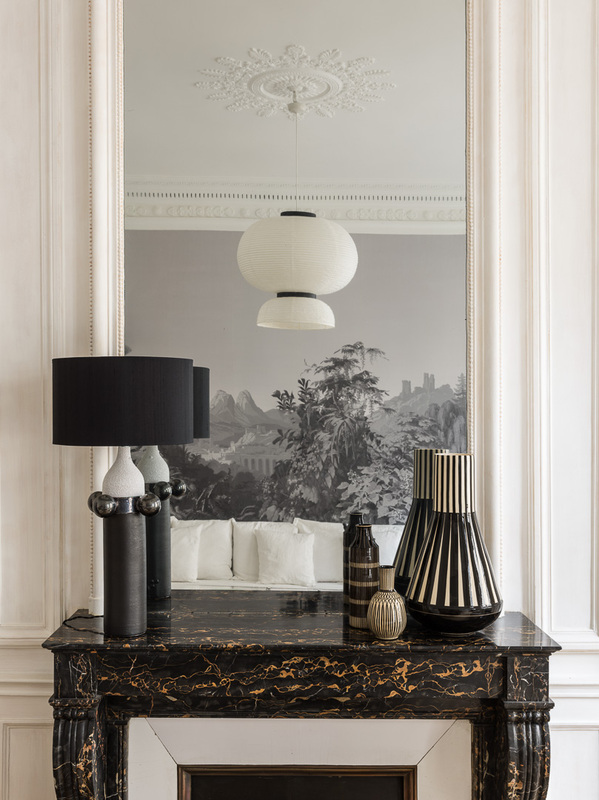 Today, we swoon over the opulence, elegance, and timelessness of their designs but the reality is that it was thanks to the vision of one public official: Baron Georges-Eugène Haussmann. 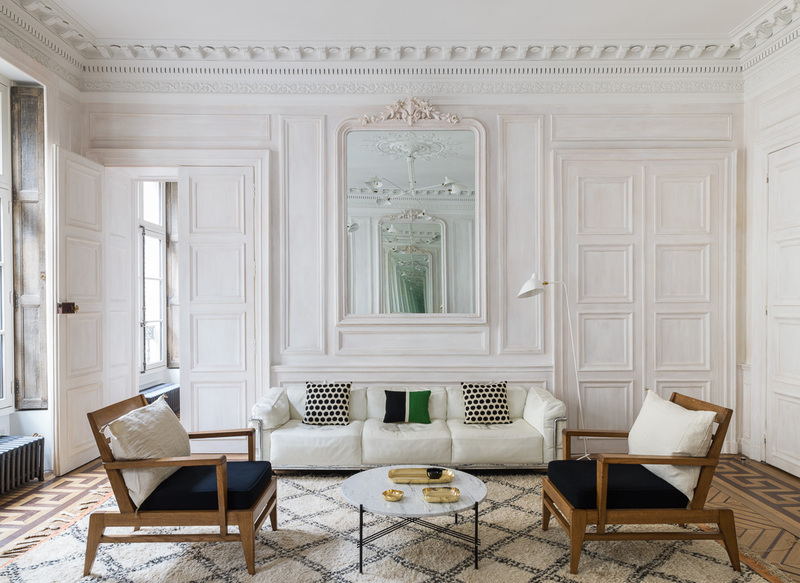 Before we get into the 9 characteristics of Parisian Haussmann-style apartments (you know the type, they are probably in every one of your home-focused Pinterest boards), let us first explain who Baron Haussmann was and why he was so important. All buildings are made of pièrre de taille: this is a light gray hewn stone with its quintessential decorative flourishes. A carriage entrance: many of these buildings have carriage entrances that lead into a small courtyard. Since they were built in the 19th Century there was a need for the nobility to be able to enter their buildings with a horse-drawn carriage. Guard stones at the entrance: you may be wondering what those heavy, brutish stones are at the entrances of these types of buildings. Since there was a need to let carriages enter the courtyards, guard stones were placed to protect the sides of buildings. 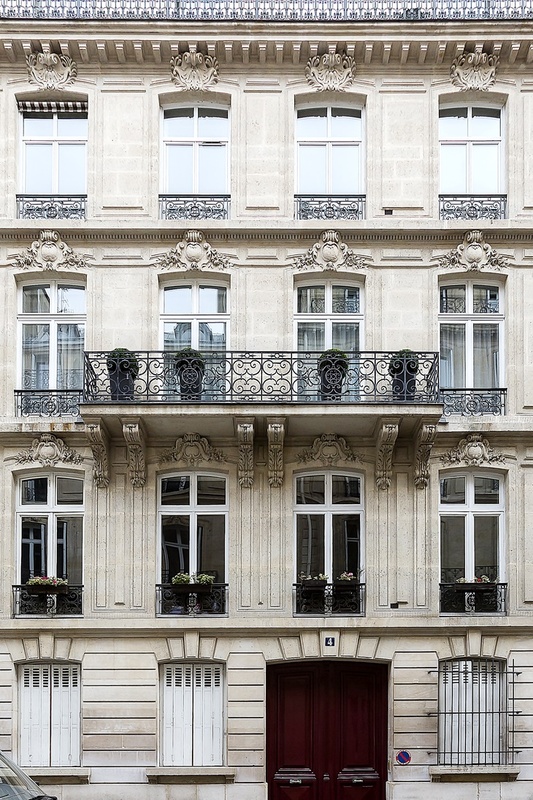 The first floor of every Haussmann-style building is actually an entresol: that means that it isn’t on the ground floor and doesn’t have the same soaring ceiling height of the other floors. This first floor was primarily used by merchants and shops. The second floor is the grandest: also called the étage noble, this floor has the highest ceilings (3.2 meters or 10.5 ft). From the exterior, you will notice that the étage noble has grand balconies and in its interior, the most ornate moldings. 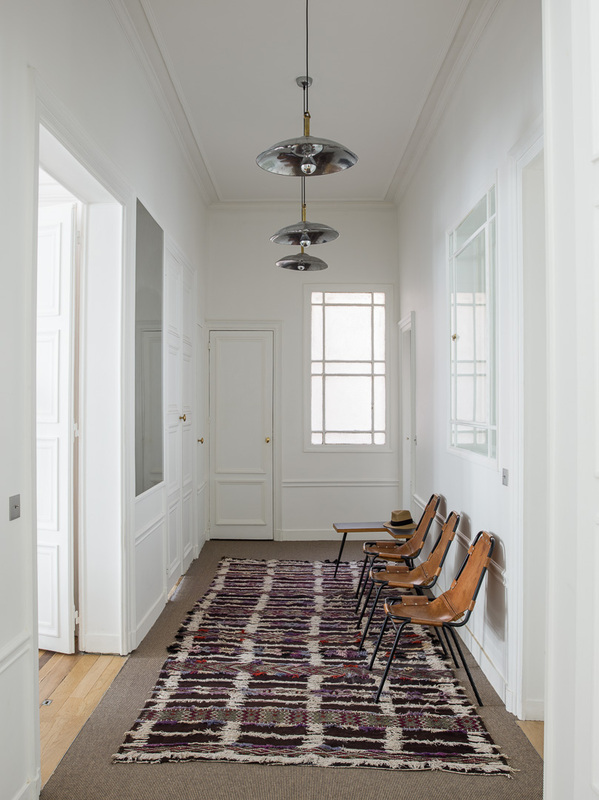 The second floor was reserved for the nobility: high enough to be away from the general public but without the inconvenience of too many flights of stairs, the second floor is where the richest Parisians lived. It was only later that elevators were installed to improve the access to higher floors. The 3rd and 4th floors are slightly less grand: as you move up the building the ceiling heights are reduced and the interior architectural flourishes become simpler. The 6th floor was for the servants: the attic, or chambre de bonne in French, was reserved for the maids and servants of the building. 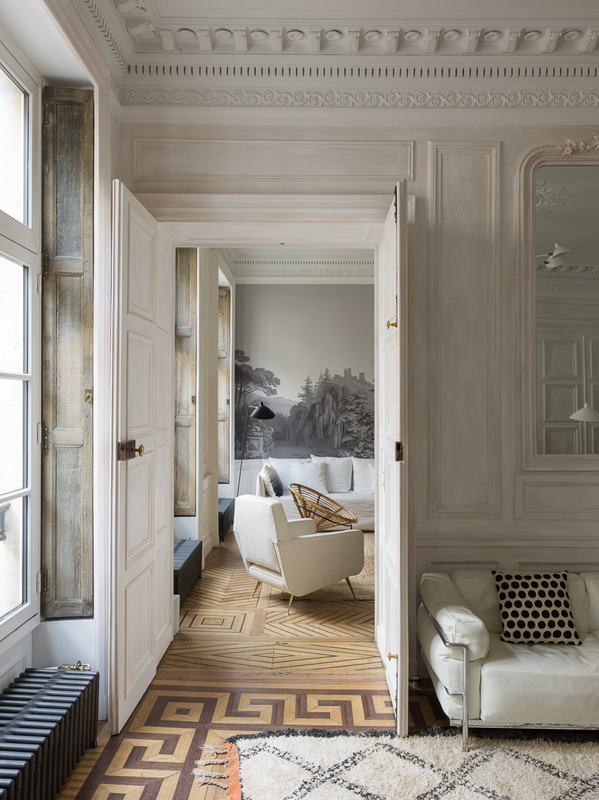 Today these apartments, although more modest in size, are coveted for their stunning views of Parisian rooftops. Rooftops had to be at a 45-degree slant: Baron Haussmann wanted to make sure that all city streets had access to as much sunlight as possible, which is why he regulated the slope of the buildings’ rooftops. Hi! Where can we find credit information for the furnishings? 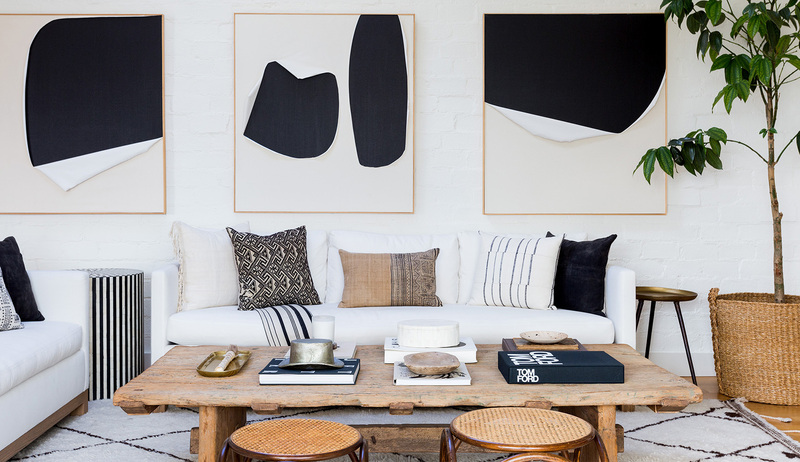 Specifically the rug in the living room and the cream armchairs. Thanks!